On the Science of Sprinting Fast. Found this interesting video online about Asafa Powell. Yes it’s in German, but you don’t need to be a rocket scientist to understand what they’re talking about. Pay attention to his running form during the slow motion captures, watch the first video from 5.50 if you’re in a hurry. Running fast is a combination of maximizing your stride length and a fast stride frequency. Notice how their foot placement are almost directly below their centre of gravity when their main torso passes through. This allows minimal braking forces created whilst taking a stride. Tried to stay low during the drive phase, but my foot placement is way too far out causing me to brake against it and come up too soon. Once again, problem is with my foot placement. Landing in front of myself causes me to run low and shortens my stride length massively. Also foot contact time is almost double of my training partner’s because of that. How can I fix this? Well the good news is that drills need to be done to make the body aware of the new movement pattern and I’ve pretty much mastered those drills. It’s now just transferring those movement patterns into my runs. There’s no magic to running fast, yes you need to be physically fit but more importantly you need to have the right running technique. *Please read the disclaimer below, you are responsible for your own life, make it count. Also, seeing that this post has helped so many over the years, and that I have since moved back to Singapore, do contact me at decatan@outlook.com if you wish to find me for personal training/running coaching, time to put my Sports Science degree to good use! Right on with it then. I was never a good runner with my fastest 2.4km only being 10min flat during OCS (never did achieve the IPPT gold because of this). When I was in school I always went for long jogs to prepare for the 2.4km run during the NAFA test, but somehow I never did seem to be able to cope with the pain and the drop in pace towards the end of the run despite the preparations I did. So once again, this time as a final year Sports Science undergrad, I will attempt to give my two cents worth of an answer to how you can effectively train for running your fastest 2.4km ever. We would first briefly look at what running a good 2.4km entails, in terms of stresses and requirements of the body, and then discuss how we can train our bodies to adapt and improve for it. Running a quick 2.4km would require you to run at near your VO2 max capacity (the maximum amount of oxygen your body can consume and utilised, often expressed in terms of ml/kg/min) for a sustained period of time and it would involve both aerobic and anaerobic metabolism (deriving energy in the presence or absence of oxygen in the body) running at those speeds. Towards the end of the run, effects of anaerobic metabolism (the production of lactate, but to be specific, lactate is not the enemy, H+ which causes muscle and blood acidity is) causes pain sensations and a drop in the ability of the muscles to continue functioning. Running economy (how efficient your body is at running) also plays a big part and would also help you to run quicker greatly if you improve on it. As that involves quite a big discussion about running techniques and biomechanics, I will leave it for another post. So what are we exactly training for? We are going to firstly train to increase the VO2 max capability of the body (increasing the stroke volume of the heart, i.e. increasing the engine capacity of your body) so that you can run faster by allowing more energy to be produced by your muscles. This would also delay and reduce the amount of anaerobic metabolism required to run at the same speed. Then we are going to train to deal with the anaerobic component of the run, namely increasing the lactate threshold and increasing the body’s ability to buffer for the acidic effects of anaerobic metabolism. So how do we train for it? Well the amazing thing about the human body is the gift it bestows upon you for doing something: the ability to do more of the same thing. We would need to expose the body to sustained high intensity exertion in the form of high intensity interval training. The aim is to maximise the time your body is running at VO2 max or close to it, thus work outs are relatively short but of high intensity. Bouts are repeated with either an active rest phase (50% effort) in-between to maintain a high heart rate in order to achieve VO2 max quickly for the next repetition, or with a shorter full rest phase compared to the exertion phase. If you have a heart rate monitor, it would be good to use it as a guide to what VO2 max levels you are running at (Polar’s website got a few really good articles about this). If not, at these speeds it is pretty easy to estimate, you just got to run as fast as you can (without going too fast on the first rep that you can’t complete the rest) so that you just barely complete the entire session. If done correctly, it should be pretty excruciating. An 8 week example program would be as follows, these are to be run at >95% VO2 max and with an active recover phase at 50% effort. It should be done once a week in addition to your existing training program and a rest or easy day (or two depending on your fitness level) is necessary after this to ensure full recovery. Proper warm ups and cool downs are required without saying. Another useful tip is to take note of how far each time you run so that you can see if you’re improving. Week 2: 5x1min runs with 2min active rest in-between. Week 3: 6x1min runs with 2min active rest in-between. Week 4: Same as week 3. Week 6: Same as week 5. Week 7: 6x2min runs with 1min 45s active rest in-between. Week 8: Same as week 7. We then move on to the next phase, which involves maximal exertion to build up your buffering capacity. For the next 4 weeks, the program would be to run maximally, for either 1 minute or about 300-400m depending on the venue available to you, and have a complete rest of about 4 times that of your work rate (e.g. 1 min run, 4 min rest). You should aim to at least complete 4 of these in a session and as this would really largely depend on your fitness, you would have to feel if you are capable of pushing it for more reps than that. If you’ve worked hard enough already, then there absolutely is no reason to in order to avoid over-training. Use your sensible head for this one and rest days are absolutely necessary following this as well. In addition you should also start to do paced 800m runs around the track to get a feel for how fast you should be running. (i.e. to run a 8min 2.4km, you need to run 1min 20s per lap. Thus run at that pace for 3-4 reps of 800m with equal or less rest ratio.) A 4x800m paced run would be a good session to add in the weeks close to the actual 2.4km testing. This week’s article is also dedicated to my training partner Max, who tomorrow would be representing Great Britain in an international indoor heptathlon match in France. Earned his first senior GB vest two weeks ago by running a blistering 2min45s (1000m), fending off a challenge at the end of that heptathlon. Been 6 years since his last GB (Junior) vest, and since then had a knee surgery, switched take-off foots due to that and worked two part-time jobs in order to continue to live and train in Loughborough. Respect mate, always an honour to train with you. Ran those minute runs with you and though you were miles ahead of me, I hope when my test comes I’ll also be ready. All the best for tomorrow! 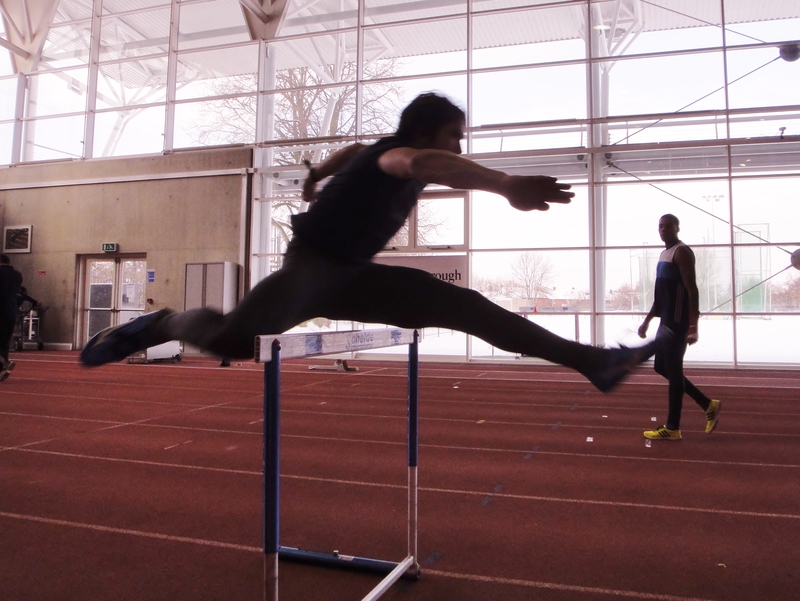 Maxim Hall clearing a hurdle with William Sharman looking on. Billat LV. (2001). Interval training for performance: a scientific and empirical practice. Special recommendations for middle- and long-distance running. Part I: aerobic interval training. Sports Med. 31:13-31. Billat LV. (2001). Interval training for performance: a scientific and empirical practice. Special recommendations for middle- and long-distance running. Part II: anaerobic interval training. Sports Med. 31:75-90. Juel C. (1998). Muscle pH regulation: role of training. Acta Physiol Scand. 162:359-366. Additional Disclaimer: In addition to my usual disclaimer below, I must add this very serious warning. What I am about to describe is not for the faint of heart (literally) and requires an already fit and healthy body. If you are a weekend warrior or a largely sedentary person, please do not even bother. Have a look at my previous post and start with a healthy active lifestyle first. The recent incident at a HPB event where a participant collapsed and died once again highlights the risk in exercise. To be honest I have ran till the point where I’m almost blacking out, but that is what we do as athletes and we continue to push it till the very edge every day. Sometimes we get it right, other times we don’t. Understand that it is a personal choice that you have to make and I am not responsible for it. I’ve made mine a long time ago and decided that if my time is up, so be it. Don’t feel bad or sorry for me if anything happens as I can hand on heart say that I’ve given it everything and have no regrets about it. So if you made your choice too, then read on and welcome my brother (or sister); I gladly stand beside you in the front lines for the quest for physical excellence. Your body does not generate mass out of thin air. Your body does not generate mass out of thin air. Everything that your body is made of came from the things that you have eaten and you are literally what you eat. Now that we have set this as a basis of understanding, we can then proceed to look at the science behind this. The underlying scientific principle of weight gain or loss is based on the caloric balance equation. So in this case losing weight and maintaining a healthy weight is easy isn’t it? All you got to do is to eat less calories than you burn and you’re on your way to your desired healthy weight. Once you do hit it, all you have to do is to maintain the caloric intake and expenditure balance and you’re happily maintaining it. So what makes maintaining a healthy weight that difficult? The problem is that we often do not eat food just for food but there are other psychological attachments to it. Some of us eat for comfort whilst others don’t for a sense of control. The extreme ones cause health problems that get very real if you, like me, have encounters friends who are like this. If you suspect yourself as suffering from any eating disorder, please talk to someone and if possible seek medical help. Do understand if you don’t, you’re not only hurting yourself but those around you that love and care for you so dearly. Another fact is that we get drawn to fatty, sweet and salty food more than ‘healthier food’. This has been theorised as an evolutionary mechanism meant to help us survive in the wild. Out in the wilderness, there is little energy dense food, or food that’s high in natural salt content and thus our minds and body are naturally drawn towards them, ensuring our survival as food is hard to come by in those days. However this mechanism is still in effect but instead of helping us survive, in a developed country that is filled with an abundance of easy to get food, it is making us eat more than we really should. Firstly love and respect your body for what it is. It will be the one and only greatest instrument that you’re going to have and for all the amazing things it has done for you, please take some time each week to properly look after it. Research has shown that for someone who ate breakfast, when it came to lunchtime, had less parts of his brains firing when shown with fatty and sweet food as compared to the same person having not eaten breakfast. Plan your meals out and don’t wait till you’re starving before you find food. Chances are if you do, you’ll unknowingly pick the least healthy option of the lot. Have a concept of calories. You don’t have to count calories or weigh everything you eat (I do that once in a while to make sure I’m eating enough and not losing weight), but you just need to have a basic concept of how much you actually should be eating. An average low active female needs 2000 kcal a day and an average low active male would 2500 kcal a day (very, very, rough estimates. Need to take into account existing height, weight and activity levels of each individual for a better estimate). Why is this important? Well let’s say you’re over eating, but just slightly. So for the sake of argument let’s say you already have what your body needs for that day and you’ve decided that you’re going to treat yourself to an ice cream dessert. An ice cream desert (1/2 cup serving, about 125 grams estimated) would give 250 kcals (I used Ben & Jerry’s Chunky Monkey Original Ice Cream). And say this amount of energy gets stored as fats (1g of fats stores about 9kcal) and assuming there is a 100% conversion rate from ice cream to fats in your body (which of course is not true, but just stay with me for the sake of the example), you will gain about 28 grams of fat. Let’s say you have that once a week, 52 weeks a year, and 5 years down the road lo and behold, you’ve gained about 7.3kg (28x52x5=7280). That my friend, is called weight creep. So what can we do about it? Well having an active lifestyle not only increases the amount of calories burnt daily whilst doing the exercise but also leaves your body in an elevated metabolic state for the rest of the day, thus a little exercise each day really does go a long way. Secondly, treasure your calories, if you can only have that much calories to consume, then doesn’t it make more sense to cook and eat the best foods you can get so that you do not waste any on mediocrity? If you’re going to treat yourself to an ice cream once in a while (which is perfectly fine and I do that from time to time too), aren’t you going to make sure that you’re eating the best damn ice cream you can find and take your time to savour the taste of it rather than gobbling it down in a hurry? Thus I’ll end this entry here, and hope that you had gained a little useful information from my little post. And if you don’t remember anything else, remember that an active balanced lifestyle and diet is the key. I will continue to write some more stuff about health and fitness in this series I call ‘Views of a Sports Science Student’, and if there’s any other Sports Science students or professionals which do not agree with my line of thinking please feel free to correct or debate with me regarding this. Physiological data is referred from the book Exercise Physiology: Theory and Application to Fitness and Performance, by Powers and Howley, 7th Edition. Enjoy your body and life! At the infinity pool with Lance Tan (SG national team, quater miler specialist) at MBS, 2010.
p.s. I will be competing in my first competition of 2011 tomorrow, Loughborough Indoor Open Meeting, doing the 60m dash and throwing the shot put. Well excited cause I’ve just came off an ankle injury (Achilles tendon kinda separated slightly from the bone) and am anxious to see what state I am in. Will keep you guys updated on how it goes!